Optimize your personal development. Be your best! Have you ever covered up negativity with positive thinking? At best, it keeps us from expressing our frustrations in public, but too often this strategy causes us to live as hypocrites, hiding our true thoughts and feelings for appearances sake. You might have noticed that you get lost in thought or are in the grip of your thoughts. This happens to everyone. 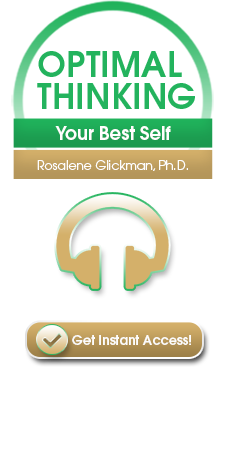 I’m Dr. Rosalene Glickman, author of Optimal Thinking: How to Be Your Best Self (Wiley, seven printings and in 17 languages). As you know, positive thinking has many advantages, but life experiences have taught me that positive thinking can also be counterproductive and even dangerous. For decades, personal development gurus have told us: “Fake it until you make it!” I don’t support this strategy. It’s dishonest, disconnects us from our highest self, and denies us of real interactions and relationships with others. You can empower your best self to create your best life regardless of what stage of life you are in, or where you are right now. 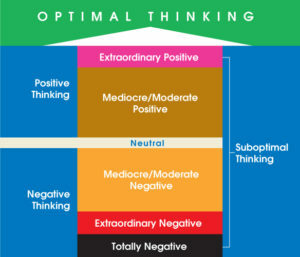 At OptimalThinking.com, you’ll find the tools you’re looking for to rise above suboptimal thinking — including negative thinking and the wishful positive thinking that lead to disappointment, frustration, distraction, hopelessness, and even trauma. To help you embark on your journey of optimum self-discovery and success, I’ve designed a quick quiz for you, Rate Your Level of Thinking. 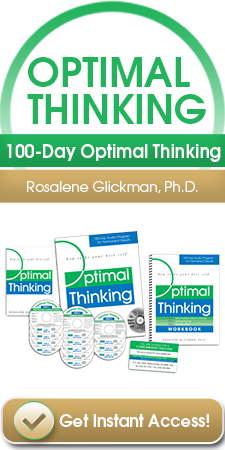 When you sign up for our free newsletter, you’ll receive my free Optimal Thinking for Tough Times road map and a link to this free quiz. You will learn about your thinking style and whether it supports your best interests. 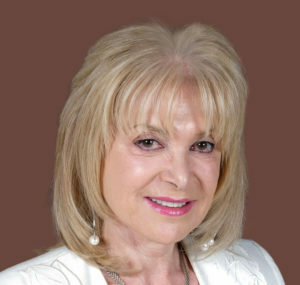 I will also point you to resources to connect with your best self, optimize – not just manage or improve – your thinking, and truly create your best life. So, don’t delay. Place your best self in charge, live your best life, and please, stay in touch! Yes, I want to find out how much of my thinking supports my best interests. 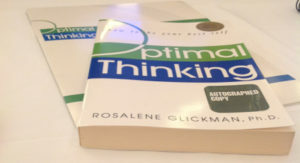 Sign me up for my free subscription to the Optimal Thinking newsletter, and send me the Optimal Thinking for Tough Times road map and a link to the Rate Your Thinking quiz. Optimal Thinking is a safe journey of self-exploration, self-expression and self-optimization. You make very clear the difference between positive thinking and optimal thinking, and give many scenarios which clearly illustrate the advantages and power of optimal thinking. Optimal Thinking has been beneficial in increasing our general managers' and sales managers' time organization and general performance.